Daily Success 4/8/2013 – I was extremely overweight and I’m not sure how I got there. 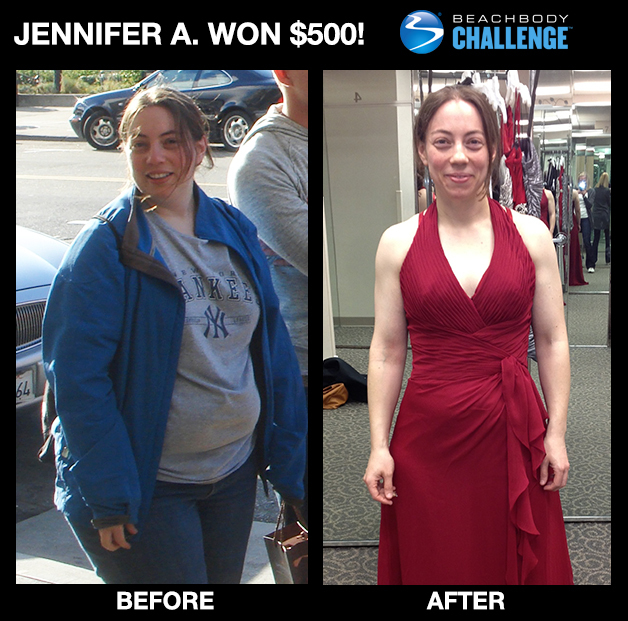 Before I was introduced to Beachbody, I was extremely overweight and I’m not sure how I got there. I was unmotivated, uninspired, and at 277 lbs.—I just figured that this was the way my life was going to be. I started taking Mixed Martial Arts classes and I was seeing results but very slowly. A little after I started I was diagnosed with a chronic illness that could severely change my life, I knew it was time to get healthy, that’s when my life changed forever. During the holiday, one student taught a section on strength training and used INSANITY. Since then, I’ve done INSANITY: THE ASYLUM® Volume 1 and Volume 2, P90X, P90X2, LES MILLS Pump, (and INSANITY a second time because it’s my first love!). A year and a half later, Beachbody has helped me lose 93 pounds (out of my total weight loss of 138 pounds) and changed my life in such a positive way. I am now a Coach and helping others. I remember when I started my journey with INSANITY, I sent my Coach a text that said, “I’m still alive… that was the craziest, hardest workout I’ve ever done! Can’t wait for Day 2!” There’s no way I would have had the success I had without my coach. Thank you for all the support through my journey! If I can help motivate and change one person’s life the way my coach helped me, than I will say I’m successful. I am truly blessed to be given this opportunity. As a physical therapist and a former college athlete, I was a relatively active person. But I knew I was capable of a healthier, more productive life—especially with my diet. I knew I was better than late night ice cream trips or fast-food cheeseburgers for dinner. And that’s where P90X2 changed my life by providing an awesome workout and a solid, fool-proof “map” to success. For me, it was as easy as learning the percentages of macronutrients—protein, carbohydrates and fat—and “Pushing Play” five days a week. Another huge help was my Facebook group—the X2 Crew. We were all doing P90X2 for the first time. We were all on the same schedule. We all shared nutrition ideas, recipes, workout ideas, and even had challenges with each other. It was a “game changer”—having the support of so many people was what I had been missing in my fitness. And it helped. I had great results through P90X2. I received numerous compliments from my family, friends, and coworkers about my new look. I achieved my goal of losing unhealthy body weight while building lean, “cut” muscle. And I am now better able to do my job as a physical therapist. Best of all, P90X2 and the nutrition guide helped me not only to succeed for 90 days, but also to continue my new lifestyle beyond the 90 days… for the rest of my life. Daily Success 2/21/2013 – I really thought I was in okay shape. Like many people, I really thought I was in okay shape. I ate what I wanted, even a pint of ice cream right before bed. I used to go to the gym a few times a week many years back, and somehow thought that this would carry me through. I realized how wrong I was when my wife took some pictures of me without my shirt on when I wasn’t paying attention. I was shocked, and frankly, embarrassed at how bad I had gotten. I thought, okay, maybe I’m up around 180, but when the scale said 205 and a body fat check showed over 25%, I knew it was time for a change. I started slow, cutting our soda and booze and phasing out junk food, but when a friend told me about P90X, that was it. I stopped and started several times, but once I found the teambeachbody website and started connecting with other Beachbody friends on Facebook, that was it. I was hooked. My first 90 days of P90X, I lost 45 lbs. and cut down to about 10% body fat. After that, I did the P90X One on One series to add some bulk. (I loved Tony’s humor and his style was perfect for me.) Then I did P90X2 —twice—and was down to 170 lbs. and 4.5% body fat!!! And you know what? I went from being able to do zero unassisted pull-ups to a max set of 27! I was at the lowest point in my life. At 47, I was depressed, sick all the time with colds, bronchitis and vertigo from stress. I was a coffee and sugar junkie. I couldn’t bear to see myself without clothes. And I was fed up with my own BS and excuses for the sad shape I found myself in. When my doctor prescribed anti-depressants that just made me more dizzy and stressed (if you can believe that), a martial arts friend of mine suggested I try this crazy program called P90X. I told myself it was time to try nature’s anti-depressant—endorphins. Guess what? It worked! P90X fit me like a glove. I was addicted to Tony and his sense of humor. The mix of strength, cardio, and flexibility kept it fun. But what I liked most was that I didn’t have to think about what I was doing each day. I just had to get out of bed and Push Play! After P90X, I did Insanity and Insanity, The Asylum. 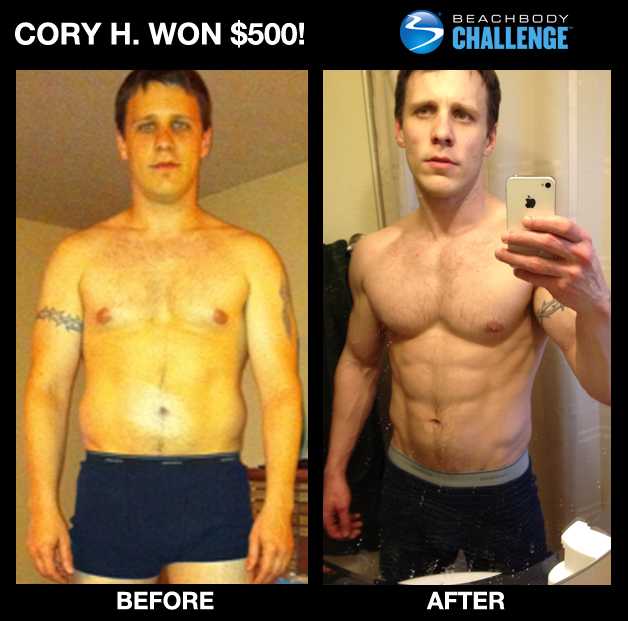 I became a Beachbody Coach to “pay it back” for the results I got. And then I tackled P90X2, which took me places I never knew about. The core strength and balance work were mind-blowing. Can you believe it? I could do levers and 4-ball pushups!!! I am a new man inside and out. I have a new career as a Beachbody Coach that will retire me from my day job and give me the PERFECT vehicle to change other people’s lives in the most profound way. I WILL NEVER go back to the person that I had become, EVER! I will forever be a Beachbody junkie living a life of passion for health and fitness and helping others do the same. After what happened to me, I owe that to Tony and Beachbody, my Coach and everybody in my Challenge Group who kept me on track! At 6’ 1” and 183 lbs., I wasn’t out of shape—I just wanted more. More for myself, more for my wife, and more for my family. I wanted to eat better and be as healthy on the inside, as I was on the outside. I wanted to inspire others while motivating my kids to be good stewards of their own bodies. But most importantly, I wanted to honor God by taking care of the body He gave me. So I committed to rising at the crack of dawn, doing P90X2®, following the nutrition guide to a T, and drinking Shakeology® daily. Three months later, I lost 13 lbs., went from a 34-inch waist down to a 31, and am in the single digits with my body fat. My core has been strengthened tenfold, which has significantly helped my lower back spasms. And I finally feel comfortable in a swimsuit. Now that I’m super fit and super healthy, I’m competing in more obstacle races and am getting back into trail running, mountain biking, and kayaking. I even plan to run the Chicago Marathon next October. But my transformation was far from easy. It took a lot of discipline saying no to pizza and donuts, a lot of Energy & Endurance® to get me through my early morning workouts, and it took a lot of support from my family and my Beachbody Coach. Yet through it all, I stayed focused and NEVER gave up. I feel great and have to say, the results are well worth it. I honestly thought I wasn’t that out of shape. I knew I needed to exercise more, but I didn’t realize how badly I felt about myself until I saw my reflection in the mirror. Not pretty. One thing that motivated me to change my life was my upcoming wedding. You know, guys want to look good on that day, too. But that wasn’t what really got me to commit. I was ridiculously tired all the time and didn’t want to go outside to play with my son. I’d tell him to go play by himself. I had an absentee father growing up, and I had promised myself I’d always be there for my son—and I was breaking that promise. I’d seen a friend lose about 20lbs doing P90X. He told me all I had to do was pop in the DVD, hit play and just do what they do. I added Insanity and P90X2 to my workout routine. Since I started, I’ve lost 42lbs and went from 28% body fat to just 5%! I went from that tired slob to a lean machine. The best part about my transformation is that I became a better husband—and a much better father. As a family we’re way more active. My wife has had amazing success as well, and my son is more active and a better athlete because of it all. I now help other people to do what we’ve done as a family, and it’s the most rewarding “job” I’ve ever had. 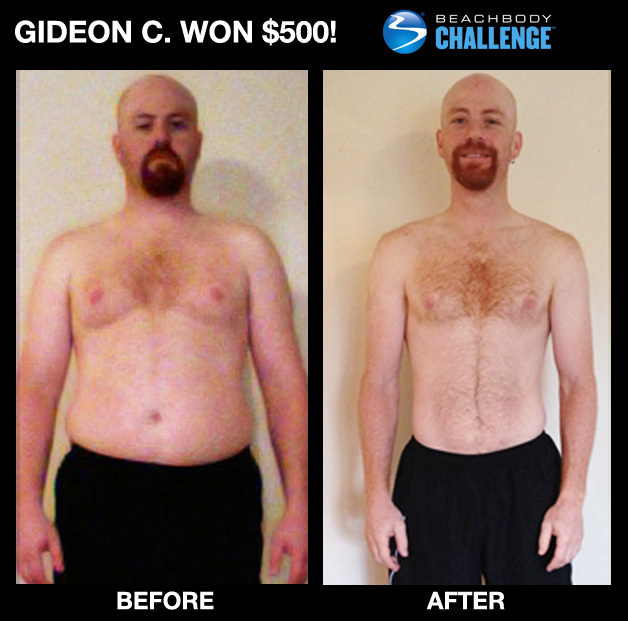 Daily Success 12/23/2012 – Gideon’s weight was out of control! Yes, I have Type 1 Diabetes. But I never took it seriously. I figured as long as I take my insulin, I could eat whatever I wanted, right? Wrong. I thought I was in good shape—until the day I stepped on the scale and realized my out-of-control eating was putting me in real danger. That’s when I realized I had to act fast. I knew my friend Jason had gotten awesome results from P90X, so I figured, that was my best hope. I tried P90X at the start of my journey and I was so out-of-shape, it took everything I had to get through the fitness test. So I switched to Power 90. It was tough, but I kept with it. And that’s when I learned the greatest lesson of my life. In the past, if I slipped just once, I would give up. I’d quit. I was programed to fail. But Tony taught me to set realistic goals and NOT BEAT MYSELF UP. That inspiration carried me through Power 90 and P90X. I lost 60 lbs., lowered my cholesterol, dropped 8 inches off my waist—and gained control over my diabetes! I’m using 50% less insulin, and I’m determined to keep going! I played sports, but I was always a ‘skinny fat guy,’ so I never really played to my potential. I knew it, but I guess I didn’t really care enough to get serious about getting my act together. Until I did P90X—and I was hooked. I lost 25 pounds and suddenly I was lighter than I had been in high school. It was awesome. Then, I was ready for more. I ordered P90X2 and it arrived the day my daughter was delivered. I was psyched. I was determined to get into awesome shape, because I always wanted to be the father my daughter would brag about! Now I’m in the best shape of my life. I’m not afraid to take on any challenge. This summer, I finished 53rd out of 4,000+ in the Spartan Mud run, and next I’m going to run the Tough Mudder, which looks crazy! 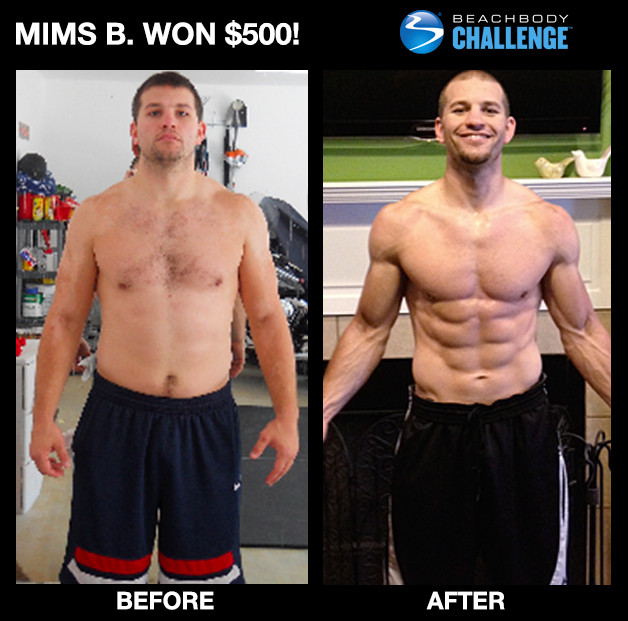 You have seen the daily $500 winners of the BeachBody Challenge but these are the 10 $1000 winners for Novemeber. These 10 people will be going for the chance to win $100,000 next June!! What are you waiting for come join me in a challenge group today! With only 4 days left of me doing P90X2 brings the last session of yoga. So of course I filmed myself to show everyone that I truely do my yoga.